The Flamenco Poets Society began its annual Café Cantante series in 2007 to introduce audiences to the relationship between poetry, music and dance within intimate settings. 2017 – José Luis de la Paz Flamenco Ensemble – Houston premier at the MATCH – Midtown Arts Center featuring José Luis de la Paz, solo guitar; Adolfo Herrera, percussion; Kenneth Jimenez, bassist; Niurca Márquez, baile. Co-sponsored with Lucia & Valdemar Flamenco and Guitar Houston. 2016 – Sor Juana Inés de la Cruz – Love Poems. Special collaboration with original compositions by pianist Hsin-Jung Tsai and Thomas Helton, bass. Poetry reading by Lorena B. Fernandez. 2015 – Flamenco Rhythms – Traditional Flamenco format at Casa de Lucia. Randy Cordero, flamenco guitar with Paco Garrigues on Cante and baile Laura Garrigues. 2014 – Manuel de Falla & Federico Garcia Lorca – Music & Poetry – Featuring Brinton Averil Smith, cello & Evelyn Chen, piano with Siete Canciones Españolas, Danza Española from La Vida Breve & Danza Ritual del Fuego de “El Amor Brujo” Ben Lind, Poetry Reading. The program commemorates Lorca & Falla’s historic collaboration during the Festival of Cante Jondo in Granada during 1922. 2013 – Pablo Neruda: Love Poems for Matilde Urrutia – Featuring Randy Cordero on flamenco guitar, Paco Garrigues (cante) and Ben Lind reading the poetry of Pablo Neruda. 2012 – Lorca – Lament For Ignacio Sanchez Mejias. The Society celebrated our muse, Federico Garcia Lorca with Ritmos Flamencos ( Flamenco Rhythms) with Randy Cordero, flamenco guitar, and Ben Lind, poetry reading at the Brazilian Arts Foundation. 2011 – Lorca – Poema del Cante Jondo- Poetry, Music & Dance. This special collaboration was based on “Poem of the Deep Song” included artists: Randy Cordero and Luisma Ramos ( flamenco guitarists) Paco Garrigues, cante, Alexandra Simmons & Laura Garrigues (dancers) & Ben Lind poetry reading. Randy Cordero known as “El Garrobo” is a San Antonio based flamenco guitarist. He has studied both in Spain and the U.S. with prestigious guitarists such as Rene Heredia, Roberto Castellon, Paco Garrigues, Kai Narezo, Chuscales, Jose Luis Rodriguez, and Domingo Rubichi. Randy’s musical style is a blend of traditional Jerez style flamenco and contemporary influences. An up-and-coming flamenco guitarist of great passion, he is in great demand to perform with flamenco groups throughout Texas. In addition, Mr. Cordero has collaborated with other professional flamenco artists and dance companies in Colorado and Mexico. 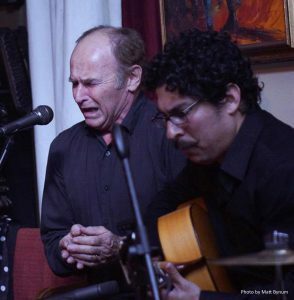 Randy works closely with Flamenco Cantaor and guitarist Paco Garrigues and their duo, “Garrobo y Garrigues” strives to offer Texas a new perspective on flamenco. As an instructor, Randy teaches the basics of flamenco guitar to students of all levels. Using patience and dedication, Randy believes in passing down his skills to the next generation by emphasizing the traditional techniques of flamenco and exploring more modern influences. At present he is the artist in residence for The Flamenco Poets Society – Café Cantante Series.